Let's Start Coding creates electronic kits and online lessons that teach computer coding to kids. 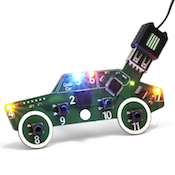 A kit from Let's Start Coding contains customizable electronics, like LED lights, speakers, buttons, and sensors. Through our online examples and projects, kids learn to manipulate these physical gadgets with code, building gadgets like a 'four note piano' or 'sound-sensitive LEDs' or whatever they can dream up! When just starting to code, small successes and engaging projects are key to fostering more interest. 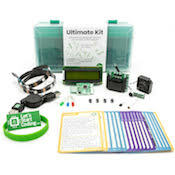 Because the outcome of kids’ code is immediate, visible, and exciting, a kit with electronics is a great starting point. 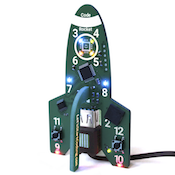 We want kids to tinker, experiment, and get immediate feedback from their efforts. When kids open our desktop coding app, they'll find pre-written example code that already works for their gadgets. They'll also find challenges to change the code and modify its outcome - this engages their problem-solving skills without boring them with mundane 'set-up' tasks. Let's Start Coding kits teach the fundamentals of typed coding. We use the same programming language found in professional environments all over the world. If you or your kids want to learn real code in a hands-on way, our kits are a great place to start.